Shooting for the Pilot Episode 2.0 has officially started. Contrary to the unaired pilot episode that shall not be named, we're getting TONS of goodies; even official ones! The days of lurking the internet for a tiny glimpse of the set or the cast (or even a prop or location) are finally over. On July 9, Executive Producer Peter Lenkov shared pictures on Instagram of some bonding time with Lucas and Justin. The next day, he gave the fans more reasons to speculate and discuss by posting pictures of a call sheet, a sign with the words "cover blown" and one of a leather jacket. THE brown leather jacket of our favorite hero. How great is that? Big Shanty Antiques posted on their Facebook page on July 10 that their parking lot was used as the crew base camp. 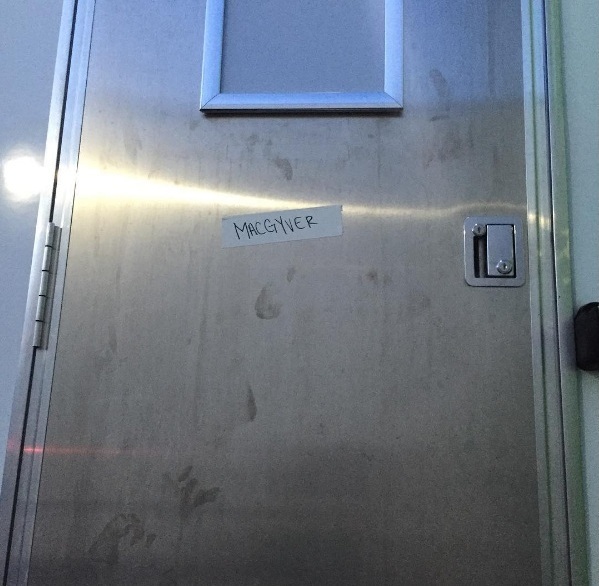 On the same day, Lucas "showed off" by posting a picture of his "ostentatious" character name plate on his trailer door. Good to know that MacGyver 2.0 also likes to keep it simple. Lenkov kept posting appetizers for the whole week. He shared several pictures of the main cast on Instagram; mainly pictures of Lucas and George, but also from their stunt doubles and other cast members, e.g. Tristin Mays. He let us know about night shoots in a forest, on a boat, at the Swan House and about what the crew does while waiting for the rain to stop so shooting can resume. He also posted several short videos; e.g. of Lucas in character running towards the camera or of his stunt double jumping on a blue-screen-truck (masquerading as a plane). The crew even worked on the weekends on scenes involving helicopters, military trucks and trains. One picture shows Lucas already shooting some ADR scenes, which might hint at the reboot keeping the MacGyver voice overs from the original show. Other crew members like Set Lighting Technician Mike Collins also posted very nice set pics (although they are much harder to find); e.g. by "Mike J Neal" from the boat scene in Stone Mountain State Park or by Location Scout Gonzo Rey from a night shoot in the forest. Eric Heaf had already shared a picture of the crew shooting at McCollum Airport. 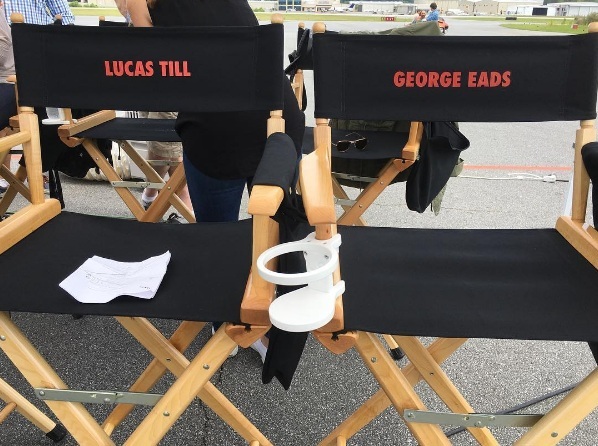 On July 12, CBS posted a first Behind-the-Scenes-Video from this set; including Lucas and George giving short statements and Lucas acting a scene by hanging off an airplane while trying to ground it with his SAK. In general, fans were very happy about MacGyver's improved look with the new haircut and the brown leather jacket. Also, George and Lucas seem to get along very well, hinting at an established "bromance" between Jack and MacGyver. Filming at the Swan House included a scene of an estate party with expensive cars and rich party attendees. Peter Lenkov posted a short video of MacGyver getting out of a beautiful vintage car while wearing a tux. Oh, we all remember MacGyver's love for wearing a tuxedo (ahem), so fans are already curious what our hero is doing at this party (presumably taking place in Italy since all the cars have Italian license plates). Understandably, crew members and extras couldn't get enough of posting pictures of the set; especially the cars (or themselves in front of the cars). Several crew members referred to James Bond for this scene; e.g. Gonzo Rey (James Bond? 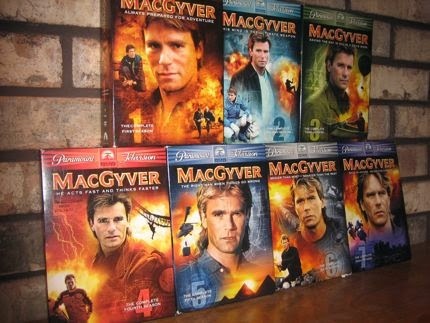 Or MacGyver? 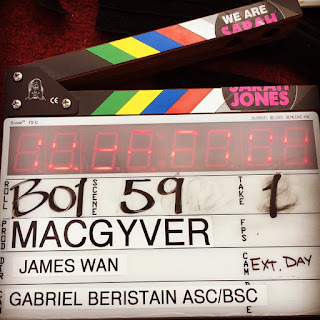 Who knows...) or Meghan Lyvers (#macgyvermeetsbond). Interestingly, Lucas Till's father and his stepmom have a cameo in this scene. Lavonda Till tweeted a lovely BtS pic of the three in costume. Peter Lenkov had already shared a picture of possible new cast members on July 12. Besides Tristin Mays, also Vinnie Jones and Tracy Spiridakos were on set (we still don't know what characters they will play). Stunt Coordinator Jeff Wolfe (who recently got an Emmy nomination for his work on the CBS series Rush Hour) tweeted his involvement in the Reboot on July 10. While several more casting calls were made (e.g. for hotel patrons and pool ladies), the IMDb page slowly filled up with some minor roles of guards and pilots, with extras and crew members. It seems like Keith Power (Hawaii 5-0) will be the composer (at least for the pilot episode). Since the music played an important part in the original show, expectations are very high and fans are still hoping for the original theme and musical cues to make an appearance. On July 15, Variety announced Sandrine Holt (House of Cards) being cast as series regular. A lot of fans are not happy about this - not because of the choice of the actress or the decision to turn a former male into a female character, but because Holt was cast in the role of MacGyver's boss, an ex-field agent turned director of operations named Patricia Thornton. It seems that Pete Thornton is being replaced and won't show up at all in the reboot. We all know that Pete wasn't just some series regular and that his relationship with MacGyver was an important part of the show, so we'll see how this change will hold up and how different the dynamic will turn out. It probably also depends on how they'll construct New MacGyver's background story (e.g. 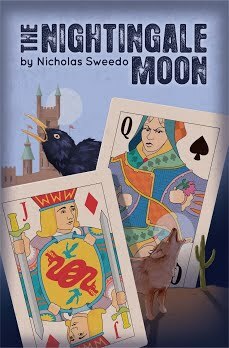 losing his father at a very young age and the age gap of more than 20 years made the father-son-type-relationship with Pete in the original show very plausible and played into many story plots). Peter Lenkov doesn't get much rest between set days and night shoots. He shared a picture of his laptop screen, showing a page of the script for Episode 1x03. But a hard working crew needs a break every now and then. Between night shoots, they got to enjoy a ball game together before filming again on Sunday morning (July 17). 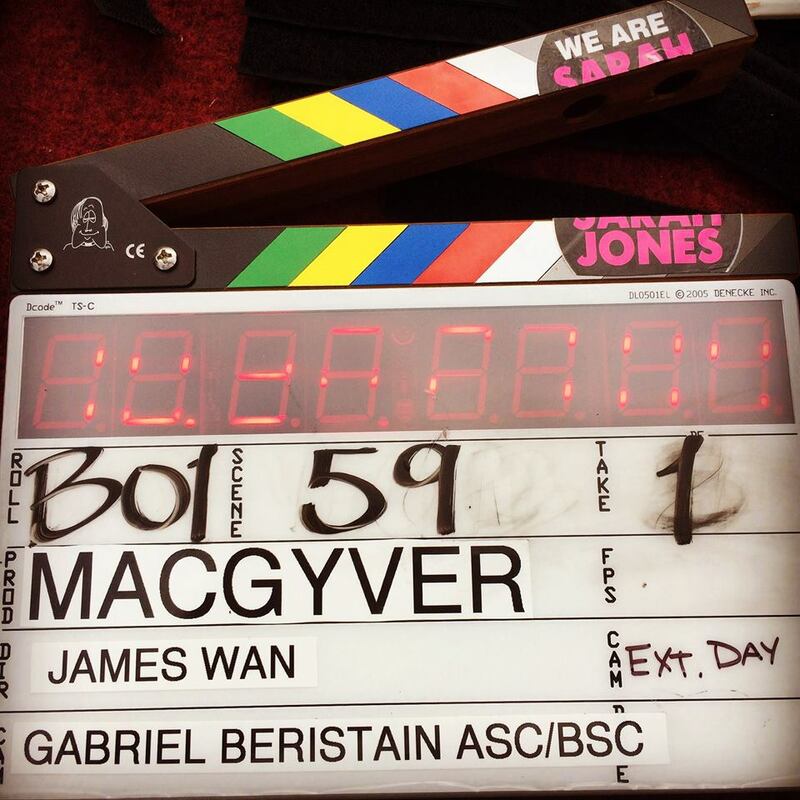 They probably have to shoot some scenes in advance as Lucas, George, Lenkov and pilot episode director James Wan will attend the MacGyver panel at ComicCon SanDiego on July 21, where the fans get to enjoy an exclusive sneak peek. Great stuff Andrea! I love all the pictures. Thanks to Peter Lenkov for posting them, and it's smart for them to share and build some buzz and get people talking (just as we are now talking about it on the blog). It looks like the show is going to be pretty action packed which is great. And no one is more invested in the music than I am -- if they brought back some of the original themes it could have the worst plot in the world and I'd still leave with a smile on my face. As for Patricia Thornton, I like it! I wouldn't want this show to be a carbon copy of the old one, and this character seems like a good way to provide some homage to the past but also give the reboot a chance to go its own way. Now that you put it like that, I think I went a little far in my earlier statement. Also "ADR" is "additional dialogue recorded" - I mention that as an FYI because I didn't know what it was and just looked it up. Thanks for the latest update. I'm actually getting excited....although I don't want it to be late September just yet!!!! If they're smart, they'll keep the theme song, maybe with a bit of an update. The original idea for H50 was to change the theme song and the PTB were told *not* to do that or it would irk the fans, b/c what is H50 w/o the theme? MacGyver's kind of the same way. As for switching up Peter for Patricia - there were the same fandom grumblings about Kono on H50 and she turned out just fine. She's actually one of my fave characters on H50 in the early seasons. So, I figure, if they do the character justice, it won't be a big deal that she's a woman instead of a man.